I would get a slice of that cake, and then Bruce Boxleitner would feed me half with his fork, and I would feed him half with mine. I almost said that, but I knew you would infer it. 🙂 I cannot deny the handsomeness of the Bruce. Lovely! For fear of sounding judgmental or racist, Boxleitner sounds like something Hitler would say while shaking his fist, as opposed to something fluid like Bertinelli, which calls for pasta and wine. And doesn’t it seem like the name Bruce was officially phased out in the 70s? There is not one Bruce in my son’s elementary school yearbook. Only Braden, Jaden, and Caiden. But not Aiden Quinn. And one more thing: The Bruce has several headshots that look eerily similar to Andy on WKRP (Gary Sandy–also two names never used now). Just saying. I love online friendships!!! This cake looks amazing! I wouldn’t mind a slice right now!! Wish I could give you a slice Tip Top Liz 😀 We’ve talked about balance before and this cake has put me way over on the side of TOO MANY CALORIES. Thanks for coming over! Thanks, Melissa! I was sure I had Followed you a while back, but looks like I am not. Thinking WordPress has stirred the pot as my follows seem to disappear lately 😦 Looking forward to reading more of Glen House happenings. Appreciate you coming over. figured I’d get pummeled by pineapple fans, but there you have it–I don’t like pineapple. Or kiwi. Wish I did as I know they’re both “good for you” foods. I love the way friendships are formed! Great sounding cake, the frosting sounds especially delicious! I’m such a sucker for a maraschino cherry! Thanks, Jayne. Killer frosting, yes. Agree that looking back and seeing how certain friendships came to be is amazing. Seems they take off with a power of their own. I’ve tried to start different friendships that never go anywhere and some of my closest friendships were never really pursued. They just happen. And an online community expands a persons world so–lots of fun folk to meet! Glad to have met you and have you here. So late to reply to this, no computer time lately! I’m delighted to have met you, I just love the blogging community! Mimi! Missing you, so am glad to see you here. Oh yes, BB was the thing. And the fact that I was “Beth” in high school and my maiden last name starts with B had me convinced we would eventually marry. Turned out not to be the case, but it was fun to enjoy a second round later in life. Thank you for coming to my high-calorie kitchen. One of these days I should serve up a salad. Figured I’d yank another SMK fan out of the blog woodwork with this post. So glad it’s you 🙂 lol, something about waiting out a pregnancy with Amanda and Lee. I met the cast members (save Kate Jackson and the guy who played Billy as he had passed) at the anniversary. The boys were there–all grown up. One was a doctor 🙂 Martha was va-va-voom gorgeous and brought a Fabio-like date. I was at her dinner table and she was talking about the TV pilots she was working on. Do you remember the guy who played Dr. Smyth? He was very creepy in real life. Ah, memories… haha. Also figured I’d be in the minority by not liking pineapple. Not sure why it doesn’t appeal. I’d say too sweet, but that can’t be as I love rock candy and marshmallows. Something about the way it’s sweet puts me off. And it’s so wet. Though pineapple upside-down-cakes I enjoy. Go figure. Those bloggers, such studies in contrast 😉 Thanks for putting up with me, mama! I think it’s so cool that you made this great online friendship that translated into a real tangible one. That cake is lovely and sounds delicious, very brave of you to use pineapple when you dislike fruit in cake. 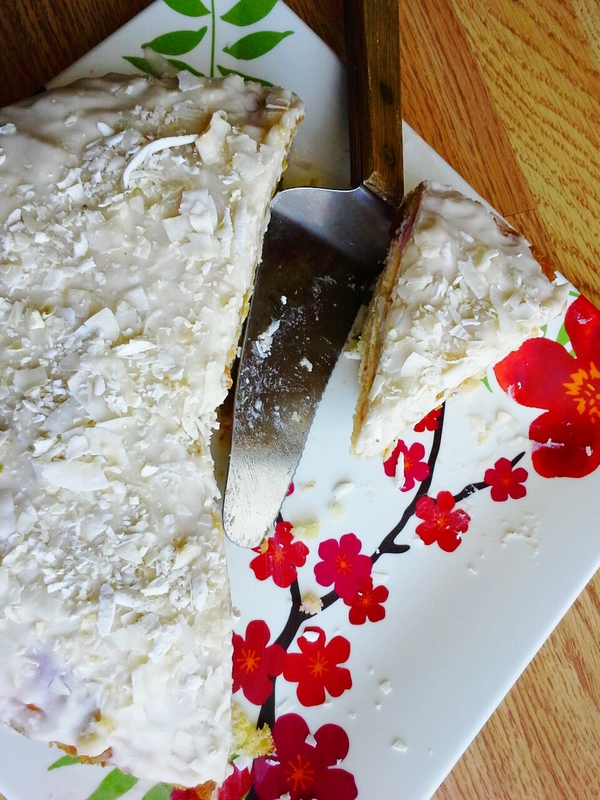 That cake is so creamy, love it! Thank you, Suzanne 🙂 You’v made amazing blog connections as well, I know. It’s all good! No idea why the pineapple sounded tasty. Wondering if the brown sugary upside-down-cake pulled me in. Appreciate being thought of as brave, but more likely I blindly follow when something grabs me. Yes that’s it, amb–a piña colada with frosting 🙂 I am putting you in charge of my marketing dept. The salary is double what you make at BoFN and you get unlimited free virtual food and drink as long as you’re on the job. Interested? Thanks for the heads-up on Becky’s post. Will hunt her down soon. Yum! Looks and sounds really tasty! I had a piña colada cupcake filled with raspberry jam over ten years ago that I have never forgotten. By any chance do you think this recipe would hold up as a cupcake with a filling? Wow, that cupcake made an impression! Not sure this would bake well as cupcakes as it’s so moist (then again, I did double the rum per instructions), but it would be lovely with a spread of raspberry jam between layers. Am sure you’ll come up with something 🙂 Thanks for the visit! First of all I love that it’s Ted’s cake recipe. Then there is the coconut and pineapple. But it doesn’t stop there, you added rum–which rhymes with YUM. Thanks, Tracy. You and Ted would get along well, I think. Di takes him on her travels and snaps photos wherever they go. He’s been to multiple Cape Canaveral launches which impresses me greatly. Also a big spender at Build-a-Bear, lol. The Teddy Bear Trifecta–perfect, yes! Your well-phrased thoughts are always welcome here 🙂 Thanks, Bon. I need a Ted in the house, for the days when we just want white chocolate cupcakes! I’m not a fan of pineapple either! I like the flavour, but the texture often makes my skin crawl. But since you seemed to be able to enjoy it in this cake…I might have to try this sometime. finally, someone in my pineapple (free) corner. Agree that the moisture, which is trapped inside of a chewy, stringy casing, is bleagh. 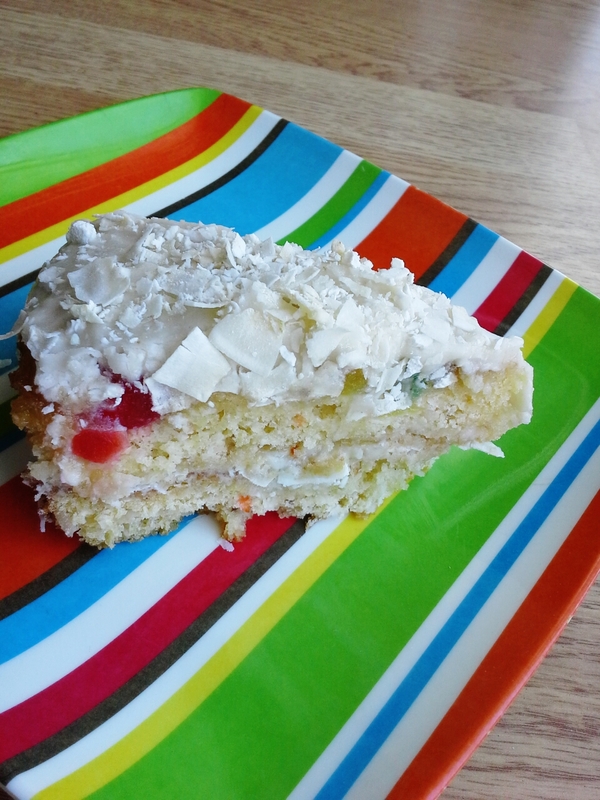 But this cake was good and that pineapple moisture is part of the reason. Though I’m giving most of the credit to the rum 😉 Thanks for coming over, Jenny. Google has the answer to everything! Appreciate your thoughts, Ada. Love when you visit. Here’s another treat I wish I could share in real time. what a great story to go with the fantastic looking recipe. that’s so cool you formed a bond from your samk fetish. i was not a huge fan, but i remember it, and was equally geeky and into columbo, mannix and hawaii 5 0. yeh. I adore Columbo! Have it all on DVD (which was a bigger deal back in the day before Netflix, etc) and am simply mad over Peter Falk. At least you gave the fruit-in-baking thing a whirl despite your opinions about it. I looks great. I would have kept going back for more of that too. The ingredients sound like a great combination. I can almost taste it. I’m nothing if not relentless in my pursuit of fun in the kitchen! Now if only I had a hat as cute as yours 😀 Totally could use it with this phenomenally cold winter. That line made me laugh. And the laugh again. I know what you mean. It has been a long winter indeed. I also remember watching scare crow and mrs king. Wow, brings back memories. Hadn’t thought of that show in years. I had know idea folk got into it that much. Very cool. You know about those sub-zero days, Patrons. You know. Though I’m crossing fingers and praying to your grill gods that the worst is behind us. Thanks for coming by. Still amazed that you’ve kept the grill fest going even with this crazy cold weather. you would, too (dare, that is), Shanna. For sure you would 😉 It was a surprising cake for me to make, but good to shake ourselves outside of our culinary comfort zones now and again. Thanks! It looks crazy fluffy and lovely! Thank you, CCU 😀 “Crazy, fluffy, lovely” is my new favorite mantra! I think I shall have a crazy, fluffy, lovely day and I wish you the same. Liz, you and your recipes literally blow my mind. Is this a good thing? If not, I am ever so sorry. It’s a fabulous cake and I’m sure I can check out the cupcake-ability of it – it’s fab, how can it not be fab in cupcakes? Well, actually, you folks would know better than me, but if I can persuade the assistant to help me try it we’ll submit our results. I can’t understand a dislike of pineapple, but then I have my own hangups and won’t eat furry fruit at all (don’t like fruit you have to shave – kiwis, peaches and so on.) To be fair, as a teddy bear, I don’t much like fruit except pineapple, and strawberries, the rest are all far too healthy for my liking. We need our calories to keep us round and cuddly! Glad you all liked the cake! so there’s the story! Am waiting for the next recipe 🙂 Will check out the baboons etc soon enough. You always have such interesting stories Liz! 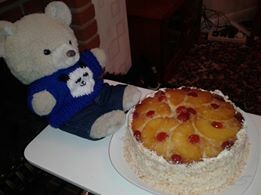 Great sounding cake and love a bear that bakes! Thank you 🙂 At the heart of things, I think that’s why food appeals–always a story. Thank you for this opportunity, Elin. That’s fantastic! Really lovely, entertaining post. Everybody has a guilty pleasure. Might check out SMK. It’s on Netflix. Saving this cake recipe. I think my mom has been hinting that she would like a pineapple cake so I think she will like this.